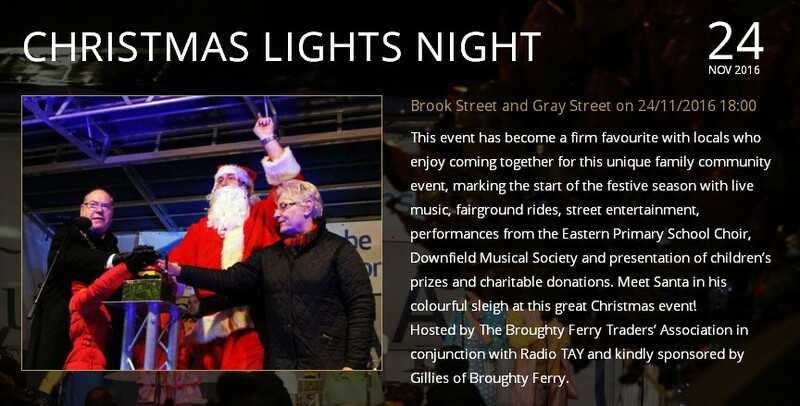 Organised by Broughty Ferry Traders' Association, the evening of events leading up to the switching on of the Christmas Lights in The Ferry has become a firm favourite in our community. It marks the start of the festive season with fairground rides and street entertainment. The funfair and Radio Tay stage will be running from 6pm, while local traders including Scotts Butchers and Visocchis will be on hand to offer food and drink throughout the event with some shops staying open throughout the evening. The event, held on 24 November 2016, gets under way with live entertainment from 6pm. Dundee Lord Provost Bob Duncan will then switch on the lights at 7.30pm. Motorists should note that the central sections of Brook Street and Gray Street will be closed to traffic from 2pm until 9pm although shops in Broughty Ferry will remain open as usual.